Pulsed-laser shadowgraph and schlieren imaging techniques have been utilized in the Bethel physics department in recent years to produce high-resolution images for a variety of problems involving shock waves and compressible flows. 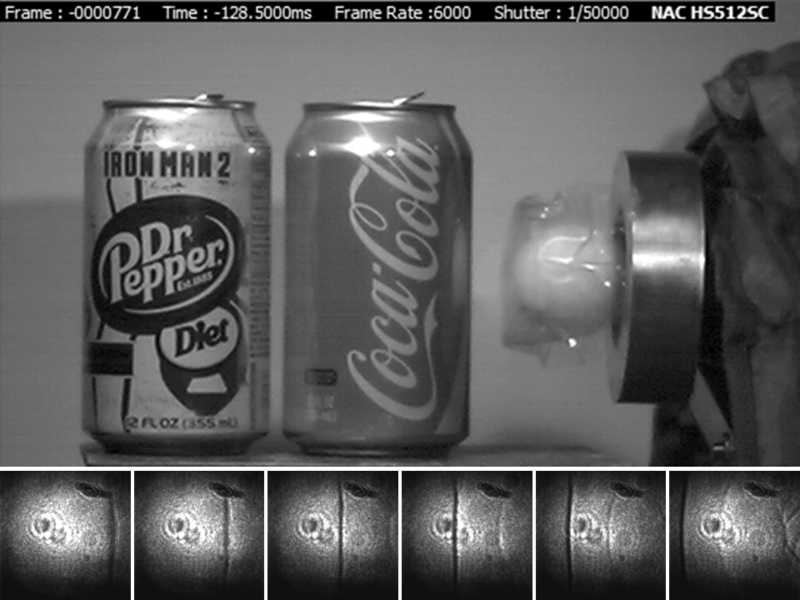 More recently, some of these shadowgraph and schlieren studies have been revisited using high-speed video (HSV) to provide a more complete description of the highly-transient shock behavior present in this class of problems. Figure 1: Ping pong ball exiting expansion tube accelerator (top); HSV shadowgraph sequence of shock waves exiting tube in front of ball (bottom). The utility and ease of current HSV technology makes synchronization and imaging of highly transient events almost as easy as operating a digital oscilloscope. HSV allows for rapid inspection of results and subsequent modifications that enhance even the beginning student’s creative options within the advanced lab setting. Motion analysis software allows for straightforward analysis of shock waves and other highly dynamic flow features. With the increasing affordability of this technology, HSV can have a viable and valuable role for studying and teaching physics in the advanced undergraduate laboratory. Figure 2: Shock diagram from a MATLAB simulation based on the 1D compressible Euler equations and the coupled ping-pong ball motion (see Olson et al, Am. J. Phys. 74, 1071, 2006). The path of the ball (left to right) is traced by the bold black line. The reflections of the density waves on the right boundary are the source of the shock waves shown in the shadowgraph images in Figure 1. This workshop will focus on two applications which have been extensively studied within the framework of the advanced lab experience at Bethel: the expansion tube accelerator (i.e. 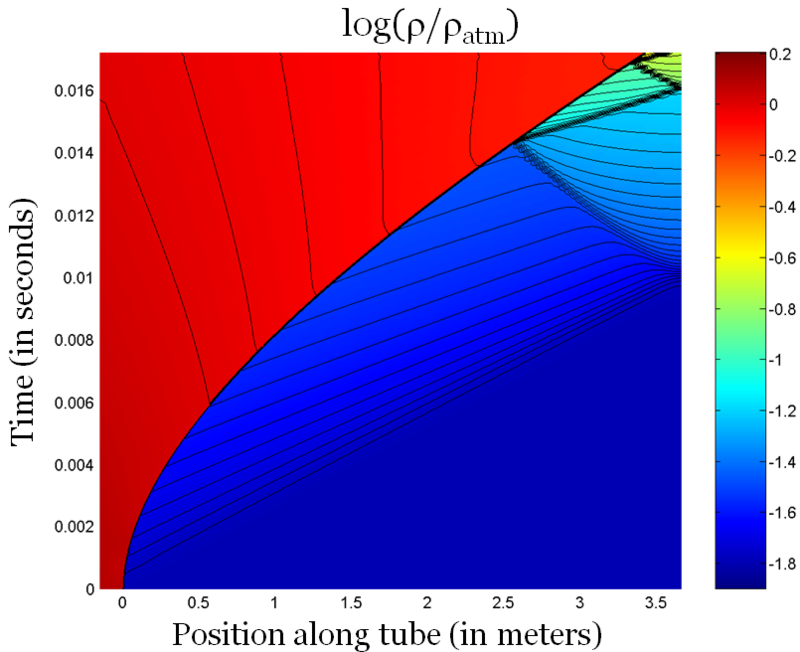 ping-pong cannon), and supersonic flow in a shock tunnel. Before diving into the use of HSV, a brief overview will be presented on the broader role of fluid mechanics and computational physics in the Bethel physics advanced lab experience. A short introduction will be provided on the compressible flow physics and some of the computer modeling that has supported these studies. Following the introductory and background material, HSV shadowgraph and/or schlieren techniques will be exploited to produce detailed video images of the shock features present in an expansion-tube accelerator (i.e. ping-pong cannon) and for supersonic flow in a shock tunnel. Important HSV considerations such as frame rate vs. resolution trade-offs, necessary shutter speeds, and lighting requirements will be addressed. The final day of the workshop will provide the opportunity for participants to focus on a problem of specific interest and/or to connect with one of the other concurrent Bethel ALPhA immersions.